AVID Entertainment has released Ella Fitzgerald CDs before, and we have released Louis Armstrong CDs before (lots of em!) but our latest release on the AVID Jazz label is a first. Ella & Louis together were a formidable partnership, a marriage made in heaven, some would say! Originally an idea by producer Matt Gabler to connect these two jazz giants together, the idea was picked up by legendary producer Norman Granz (manager of Ella and pianist Oscar Peterson). 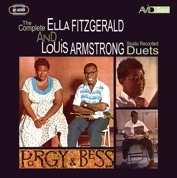 What followed was a series of matchless classic albums featuring Ella on vocals, Louis on vocals and trumpet, with Oscar Peterson accompanying them on piano. Ella even insisted that Louis chose the songs! Among the fine recordings presented on this superbly re-mastered 2CD set you will find the complete classic album Ella & Louis together with selections fromElla & Louis Again and Porgy & Bess alongside a whole host of other wonderful duets. 9. Cant We Be Friends?